We have found our Tickles! He is safe and sound! Tickles the parrot is back home. My Edmonds News reader Joy Whitten reported to us Sunday night that she had spotted a parrot in the area of 3rd Avenue North and Edmonds Street, but her attempts to capture him were unsuccessful. 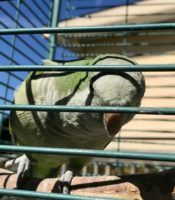 After we posted the information here, reader Susanna Martini commented that she and her 10-year-old daughter were missing a parrot who had flown out the window Saturday. “He responds to Tickles and can say peekaboo, come uh-oh, good bird, good boy, doo doo, (like you are singing a song), come Echo (our dog),” Martini said. Martini also got in touch with Whitten about Tickles. She and her daughter were about to go out looking for him Monday morning when she received a phone call from Whitten “that he was on a truck of the construction site on Edmonds Street,” Martini said. Her daughter brought some of Tickles’ favorite treats, and Martini and her daughter were able to put a blanket on him — and then took him home. He is a green quaker parrot. He responds to tickles, come on echo, and quack quack quack. If anybody hears him or sees him in Edmonds please give us a call or email us. If it is possible to have volunteers help us look that would be very appreciated as well.